Vaccine adjuvant-induced inflammation augments vaccine immunity in part by recruiting APCs to vaccine draining lymph nodes (LNs). However, the role of one APC subtype, inflammatory monocytes, in regulating vaccine immunity in healthy animals has not been fully examined in detail. Therefore, vaccine-mediated monocyte recruitment and subsequent immune responses were investigated using murine vaccination models and in vitro assays. Recruitment of inflammatory monocytes to vaccine draining LNs was rapid and mediated primarily by local production of MCP-1, as revealed by studies in MCP-1−/− mice. 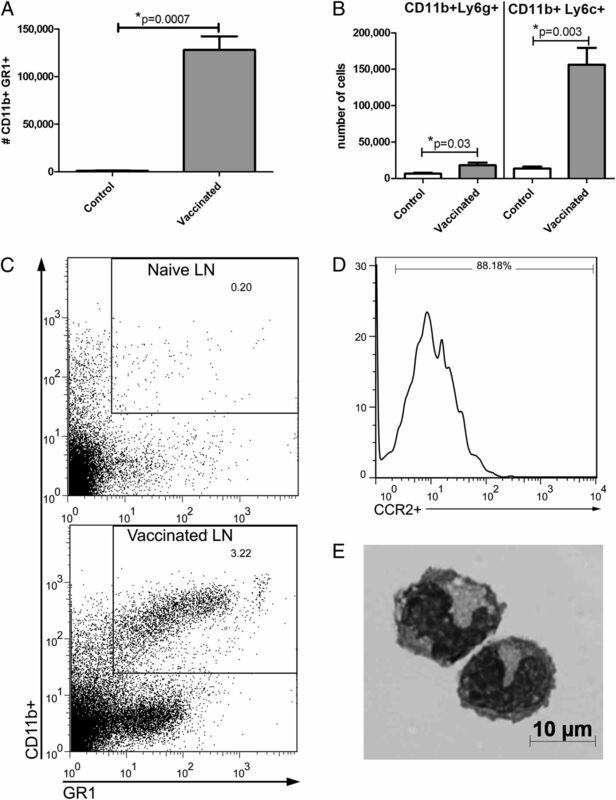 Interrupting monocyte recruitment to LNs by either transient monocyte depletion or monocyte migration blockade led to marked amplification of both cellular and humoral immune responses to vaccination. These results were most consistent with the idea that rapidly mobilized inflammatory monocytes were actually suppressing vaccine responses. The suppressive nature of vaccine-elicited monocytes was confirmed using in vitro cocultures of murine monocytes and T cells. Furthermore, it was determined that inflammatory monocytes suppressed T cell responses by sequestering cysteine, as cysteine supplementation in vitro and in vivo appreciably augmented vaccine responses. These findings indicated, therefore, that vaccination-elicited inflammation, although necessary for effective immunity, also generated potent counter-regulatory immune responses that were mediated primarily by inflammatory monocytes. Therefore, interrupting monocyte-mediated vaccine counterregulatory responses may serve as an effective new strategy for broadly amplifying vaccine immunity. Much research effort has been devoted to developing vaccine adjuvants with greater potency and duration of action (1–6). However, currently, little is known regarding potential counterregulatory mechanisms that may be generated by vaccination or how these mechanisms may regulate vaccine responses. Vaccination has been reported to trigger the mobilization and recruitment of inflammatory monocytes to vaccine draining lymph nodes (LNs) (7–10). One study identified expansion of this cell population after vaccination but did not identify the role these cells play in vaccine immunity (7). In another study, vaccine-elicited monocytes were found to increase IFN-γ production by T cells in draining LNs, and it was concluded that inflammatory monocytes were important in augmenting vaccine responses (10). However, those studies did not specifically examine the regulatory effects of monocytes by depleting the cells or blocking their migration to LNs. In addition, this work relied heavily on monitoring IFN-γ responses in CCR2−/− mice, which are known to lack the ability to produce IFN-γ (11). Other studies noted that high doses of vaccine adjuvant promoted mobilization of monocytes and neutrophils that dampened vaccine response through an inducible NO synthase-dependent pathway (8, 9). Monocytes are recognized as key immune effector cells that can mediate protection against a number of different pathogens (12–15). At the same time, monocytes and macrophages are also associated with immune suppression and promotion of tumor growth and metastasis (7, 16–18). For example, studies in tumor-bearing mice have shown that cancer-induced myeloid suppressor cells inhibited vaccine responses, which could be reversed by depleting myeloid cells (19–22). However, the role of inflammatory monocytes in regulating vaccine immunity in healthy animals has not been thoroughly studied, particularly with respect to the interaction between monocytes and T cells in vaccine draining LNs. Because monocyte responses are regulated by both systemic and local cytokine signals, it is difficult to extrapolate from vaccination studies in animals with cancer to studies in healthy animals. Therefore, it remains an open question whether recruitment of inflammatory monocytes is essential for enhancement of vaccine responses, especially in healthy individuals without pre-existing expanded populations of immunosuppressive myeloid cells as found in animals and humans with cancer. Healthy mice were vaccinated and the roles of local inflammation, chemokine release, and monocyte recruitment in controlling vaccine responses were assessed, including both cellular and humoral immune responses, to investigate monocyte regulation of vaccine immunity. Mice (C57BL/6 wild type and CCR2−/−) were immunized using different vaccine adjuvants and monocyte recruitment to LN, and vaccine immune responses were assessed. Monocyte effects on vaccine immunity were also assessed using monocyte depletion and migration blockade, whereas the direct interaction of vaccine-elicited monocytes with T cells was explored using in vitro assays and inhibitors of known myeloid suppression pathways. These studies demonstrated an unexpected inhibitory role for vaccine-elicited monocytes in regulation of vaccine immunity. These inhibitory effects could be overcome using compounds that block monocyte migration or by providing exogenous cysteine. The findings suggest novel strategies for augmenting the effectiveness of conventional vaccines through manipulation of monocyte responses. BALB/c, C57BL/6, and ICR mice were purchased from Harlan laboratories (Denver, CO) and housed in microisolator cages in the laboratory animal facility at Colorado State University. Mice lacking expression of a functional CCR2 molecule (CCR2−/−) or CCL2 expression (CCL2−/−) on the C57BL/6 background were obtained from The Jackson Laboratory (Bar Harbor, ME). All animal procedures were approved by the Institutional Animal Care and Use Committee at Colorado State University. Liposomal clodronate (LC) was administered by tail vein injection of 200 μl LC, as described previously (23, 24). Vaccination with OVA or hemagglutinin (HA) was conducted by s.c. administration of 100 μl cationic liposome–DNA complex (CLDC) adjuvant plus 5 μg OVA or 1 μg HA protein, or 50 μl CLDC in the case of footpad injections. Animals were boosted once, 10 d after the priming injection for Ova studies. For therapeutic vaccination with HA, animals were vaccinated every 7 d until sacrifice because of progressive tumor growth. Animals were treated with the spiropiperidine small molecule compound, RS102895 (25, 26) (Sigma-Aldrich, St. Louis, MO) delivered by i.p. injection at a dose of 5 mg/kg twice daily, administered the day before, the day of, and the day after vaccination and boost. N-acetylcysteine (NAC; Sigma-Aldrich) was administered at a concentration of 100 mg/kg i.p. immediately before and every 12 h after vaccination for a total of 4 treatments for both the prime and the boost immunization. LC was prepared in the laboratory as described previously (23). CLDCs were also prepared in the laboratory as described previously (27). RS102895 was purchased from Sigma-Aldrich and dissolved in DMSO before dilution in water for injection. The A20-HA cell line and nontransfected A20 cells were kindly provided by Dr. Charles Drake (The Johns Hopkins University, Baltimore, MD). One million A20-HA cells were injected s.c. on the right flank 3 d before treatment initiation. Tumors were measured every other day using calipers. Biochemicals used to block monocyte suppression of T cell activation in vitro included 0.5 M NAC (Sigma-Aldrich), 55 μM 2-ME (Life Technologies), 200 μM Nor-NOHA (Cayman Chemical), 300 μM L-NMMA (Cayman Chemical), functional grade neutralizing anti-mouse IL-10 (0.1 μg/ml) and neutralizing anti-mouse TGF-β (1 μg/ml) (R&D Systems, Minneapolis, MN), 20 μM LoxBlock-1 (a novel 12/15-lipoxygenase inhibitor) (28), also known as compound 5680672 (Chembridge), and 30 mM indomethacin (Sigma-Aldrich). Directly labeled Abs were purchased from either eBiosciences (San Diego, CA) or Becton-Dickinson (Bedford, MA), unless otherwise noted, and included the following clones: mouse CD11b (clone M1/70), mouse Ly6C (clone AL-21), mouse Ly6G (clone 1A8), mouse GR1 (clone RB6-8C5), mouse CD8 (clone 53-6.7), mouse/human B220 (clone RA3-6B2), mouse CD11c (clone N418), mouse CD20 (clone eBioL31), mouse CCR2 (clone 475301; R&D Systems), mouse CD45 (clone 30-F11). An unlabeled rabbit Ab to mouse xCT (Abcam, Cambridge, MA) was used together with goat anti-rabbit IgG (Jackson ImmunoResearch). LNs and spleen tissues were disrupted into single-cell suspensions through cell strainers (BD Falcon) and washed twice with FACS buffer (PBS plus 2% FBS and 0.05% sodium azide). Before immunostaining, cells (∼1 × 106 for most experiments) were first blocked with normal mouse serum and unlabeled anti-mouse CD16/32 to reduce nonspecific Ab binding. Cells were incubated with Abs in 96-well round-bottom plates for 30 min at room temperature, then washed and incubated with streptavidin conjugates when necessary, then fixed in 1% paraformaldehyde before analysis. For identification of CD207+ cells, cells were fixed and permeabilized overnight before staining with CD207 (clone ebioL31). Flow cytometry was conducted using a Dako/CyanADP flow cytometer with Summit software (Little Rock, AR). Analysis was done with FlowJo software (Ashland, OR). Cell counts were conducted with an automated cell counter (Nexcelom Bioscience, Lawrence, MA). Serum was collected via cardiac puncture into serum separator tubes (BD Falcon). Serum was stored at 4°C until use. ELISA plates for quantitation of anti-Ova titers were coated overnight with Ova, then washed and nonspecific binding blocked using 3% BSA (Calbiochem, Darmstadt, Germany) for 1 h. Ab end-point titers were determined using 10-fold dilutions of serum samples. Donkey anti-mouse IgG-HRP (Jackson Immunoresearch) was used to detect bound mouse IgG, followed by addition of 3,3′,5,5′-tetramethylbenzidine. ODs were determined using a BioTek Synergy HT (Winooski, VT) plate reader and analyzed with Microsoft Excel software. End-point titer was determined at 3 SDs above control wells and plotted on a log scale. Spleen cells (1 × 106 cells in 1 ml in 24-well plates) were processed as described earlier and stimulated with the indicated peptides or proteins for 72 h: 50 μg/ml Ova, 10 μg/ml SIINFEKL (AnaSpec, Fremont, CA), 1 μg/ml IYSTVASSL, 10 μg/ml SFERKEIFPKE, or with 1.3 × 104 live A20-HA cells for 72 h. Supernatants were collected and analyzed for IFN-γ concentration, using a commercial ELISA kit following manufacturer’s instructions (R&D Systems). MCP-1 was measured using a commercially available kit (R&D Systems) following manufacturer’s instructions. Bodipy-labeled PBS liposomes were prepared as described previously (23) and delivered i.v. in the tail vein in a volume of 200 μl. A total of 5 μg OVA-allophycocyanin (Invitrogen, Carlsbad, CA) was injected in the footpad in 50 μl CLDC. Spleen and LN tissues were collected 12 h after liposome administration for analysis by flow cytometry. Mice were vaccinated in the footpad and 24 h later; popliteal LNs were collected and pooled from ∼10–12 mice per experiment. Live monocytes were sorted on a Mo-Flo cell sorter at the Colorado State University Cytometry Core facility. Positive gates for monocyte analysis included low side scatter cells that were CD11b+ and Gr-1+, whereas Ly6G+ cells (neutrophils) were excluded from analysis. Purified monocytes were incubated with naive spleen cells at three different ratios of monocytes to T cells (1:10, 1:100, 1:1,000) in HL-1 media containing 1% each of FBS, penicillin/streptomycin, and l-glutamine (29). Before incubation with purified monocytes, naive spleen cells were stained with 2.5 μM CFSE (Invitrogen) for 10 min at 37°C; then the T cells were activated with 5 μg/ml Con A for 4 d. In the indicated experiments, compounds for blocking monocyte cellular pathways were added at the time monocytes and T cells were mixed. After 96 h of incubation, cells were washed and stained with anti-CD3 Ab and proliferation of CFSE+ CD3+ cells was determined using flow cytometry. For in vivo assessment of T cell response in the presence or absence of inflammatory monocytes, popliteal LNs were collected 24 h after footpad vaccination, T cells activated with Con A, then CFSE labeled and proliferation assessed 4 d later, using flow cytometry, as noted earlier. Statistical comparisons between those data sets with two treatment groups were done using a nonparametric t test (Mann–Whitney U test). Comparisons among three or more groups were done using ANOVA, followed by Tukey multiple means posttest. Tumor growth data were analyzed by repeated-measures two-way ANOVA, followed by the Bonferroni posttest. Analyses were conducted using Prism5 software (GraphPad, La Jolla, CA). For all analyses, statistical significance was determined for p < 0.05. C57BL/6 mice (n = 5 per group) were vaccinated in the footpad using a liposome-based adjuvant and 2 μg Ova (27, 30). Within 2 h of immunization, CD11b+Gr-1+ myeloid cells rapidly appeared in the bloodstream, and their numbers in circulation remained elevated for at least 72 h after vaccination and then declined (data not shown). In addition, the numbers of CD11b+Gr-1+ cells were markedly increased (up to 30-fold) in vaccine draining LNs within 24 h of vaccination (Fig. 1A). The vaccine-elicited myeloid cells in LNs consisted primarily of CD11b+Ly6Chi cells (monocytes), with much smaller numbers of CD11b+Ly6G+ cells (neutrophils; Fig. 1B). Representative flow cytometry plots of Ly6G−CD11b+GR1+ cells are depicted in Fig. 1C. In addition, nearly all of the CD11b+Ly6C+ cells in vaccine draining LNs also expressed CCR2, a phenotype most consistent with inflammatory monocytes (31) (Fig. 1D). Cytologically, Ly6G−CD11b+Gr-1+ cells purified from vaccine-draining LNs exhibited morphology consistent with monocytes (Fig. 1E). Vaccine-elicited myeloid cells migrate rapidly to vaccine draining nodes. (A) Recruitment of CD11b+Gr-1+ cells in vaccine-draining LNs was assessed 24 h after immunization by flow cytometry. Naive LNs were included as controls. (B) Total CD11b+Gr-1+ cells were subdivided into neutrophilic and monocytic populations (i.e., CD11b+Ly6g+ and CD11b+Ly6c+, respectively). Error bars represent SEM, n = 5. Statistical significance was determined using a Mann–Whitney U test, with *p < 0.05. Experiments were repeated three times with similar results. (C) Representative flow plots of CD11b+Gr-1+ cells from a naive LN or a vaccine draining LN collected 24 h after vaccination. (Ly6g+ cells were excluded from the analysis.) (D) Representative histogram of CCR2 expression by Ly6g−CD11b+Gr-1+ cells from Fig. 2C. (E) Representative photomicrograph of inflammatory monocytes purified by flow sorting from vaccine draining LNs 24 h after immunization. Stained with H&E. The signals responsible for mobilization and recruitment of inflammatory monocytes after vaccination were investigated next, focusing on the role of MCP-1, as suggested by previous studies (32). Significant increases in MCP-1 release were observed by tissues collected from the vaccination site, as well as by draining LN tissues (Fig. 2A). In addition, MCP-1 concentrations were significantly increased in plasma of vaccinated animals within 30 min of vaccination and remained elevated for at least 6 h thereafter (Fig. 2B). To determine whether the MCP-1/CCR2 pathway was involved in inflammatory monocyte recruitment in response to vaccination, CCR2−/− and MCP-1−/− mice were vaccinated at the footpad and vaccine draining LNs collected 24 h later for analysis by flow cytometry. Compared with wild type mice, CCR2−/− and MCP-1−/− mice exhibited significantly reduced numbers of inflammatory monocytes in vaccine draining LNs compared with wild type animals (Fig. 2C). The effects of monocyte recruitment on vaccine immunity were also examined using CCR2−/− mice. We observed that CCR2−/− mice generated significantly higher Ova-specific Ab titers than did wild type animals (Fig. 2D). CCR2−/− are not capable of mounting a detectable IFN-γ response; therefore, this end point was not examined in this experiment (11). These results suggested that vaccine-induced recruitment of inflammatory monocytes inhibited vaccine-induced humoral immunity. 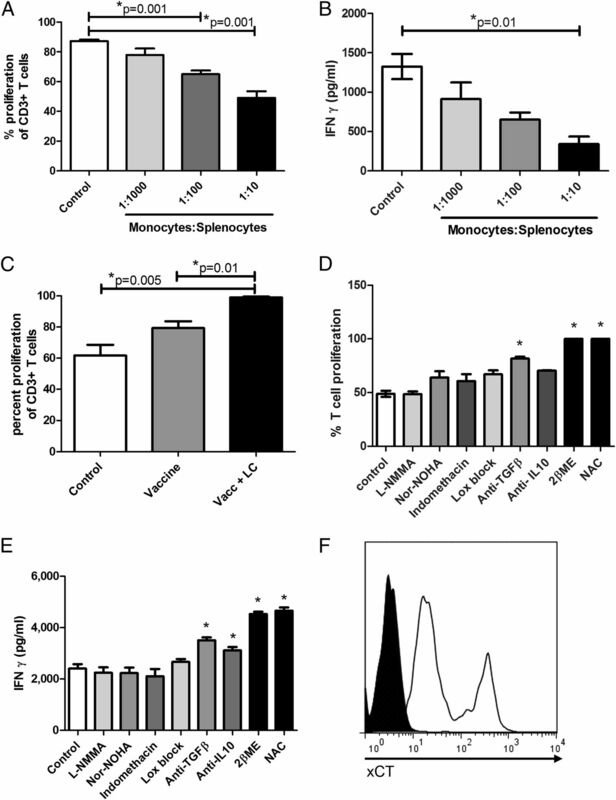 Effects of MCP-1 and CCR2 expression on monocyte migration and vaccine responses. (A) Footpad tissues (left) and vaccine draining LNs (right) were removed 2 h after footpad immunization and incubated in complete medium for 24 h. Supernatants were analyzed for MCP-1 concentration by ELISA and normalized to tissue weight (mg). (B) Mice were vaccinated and plasma was collected 30 min and 6 h later for assessment of MCP-1 concentrations by ELISA. (C) Inflammatory monocytes in vaccine draining LNs were quantified in wild type, CCR2−/−, or MCP-1−/− mice 24 h after vaccination. (D) Wild type or CCR2−/− mice were vaccinated twice, 10 d apart with Ova, using CLDC adjuvant, as noted in Materials and Methods. Anti-Ova IgG titers in serum were determined 12 d after the second immunization. Error bars represent SEM, n = 5. (B and C) Statistical significance was determined using one-way ANOVA, followed by Tukey multiple means comparison test, *p < 0.05. (A and D) Statistical significance was determined using a Mann–Whitney U test, *p < 0.05. Similar results were obtained in one additional independent experiment. Experiments were conducted next to assess the effects of blocking monocyte recruitment to LNs on vaccine responses. Monocyte depletion was accomplished using either LC or the CCR2 small molecule antagonist, RS102895 (23, 24, 33, 34). Mice (n = 5 per group) were vaccinated s.c. between the shoulder blades or in the footpad using a cationic liposome adjuvant, CLDC (27, 30), admixed with 5 or 2 μg OVA protein, respectively. LC or RS102895 was administered at the time of vaccination. Vaccination (with or without concurrent monocyte depletion or blockade) was repeated in 10 d, and vaccine-induced immune responses were assessed 12 d after the booster immunization. Concurrent vaccination and treatment with LC or RS102895 significantly reduced numbers of inflammatory monocytes in vaccine draining LNs collected 24 h after vaccination (Fig. 3A). Langerhans dendritic cells were monitored at draining LNs as well. LC did not affect the number of Langerhans dendritic cells arriving at the LN via lymphatic drainage, neither did LC nor RS102895 alter the amount of Ova Ags arriving at the draining LN as measured by florescent tracking experiments (data not shown). Monocyte depletion with LC at the time of immunization also resulted in marked increases in anti-Ova Ab titers (Fig. 3B). Moreover, spleen cells collected from vaccinated mice that concurrently received LC produced significantly more IFN-γ after ex vivo restimulation with Ova protein (Fig. 3C) or Ova-MHC class I peptide, SIINFEKL (Fig. 3D). Vaccination and concurrent treatment with RS102895 also resulted in significant increases in Ab responses to vaccination (Fig. 3E). Spleen cells from vaccinated, RS102895-treated mice also produced significantly greater amounts of IFN-γ after ex vivo restimulation with Ova (Fig. 3F). LC-mediated enhancement of vaccine response was also tested with other adjuvants. Vaccination with IFA, Alhydrogel, monophosphoryl lipid A, or polyinosinic-polycytidylic acid were all enhanced with concurrent monocyte depletion using LC (data not shown). Thus, depletion of monocytes or migration blockade to draining LNs at the time of vaccination elicited marked and broad enhancement of vaccine immunity in healthy animals. Effects of monocyte depletion or migration blockade on vaccine responses. (A) Inflammatory monocytes in vaccine draining LNs were quantified 24 h after administration of LC or the CCR2 antagonist RS102895, as described in Materials and Methods. CCR2−/− and naive animals were included as controls. (B) Anti-Ova IgG titers were determined in vaccinated mice that were concurrently treated with LC. (C) Spleen cells from animals in (B) were restimulated with Ova (50 μg/ml) for determination of IFN-γ release. (D) Spleen cells from vaccinated and LC-treated or untreated mice were also restimulated with the class I–restricted Ova peptide, SIINFEKL (10 μg/ml), for 24 h and IFN-γ release quantified by ELISA. (E) Anti-Ova IgG titers were determined in vaccinated mice that were concurrently treated with RS102895. (F) Spleen cells from animals in (E) were restimulated with Ova (50 μg/ml) for determination of IFN-γ release. Error bars represent SEM, n = 5. (A–D) Statistical significance was determined using one-way ANOVA, followed by Tukey multiple means comparison test, *p < 0.05. Statistical significance was determined using a Mann–Whitney U test, *p < 0.05. (E and F) Similar results were obtained in one additional independent experiment. Next, studies were conducted to determine whether monocyte depletion or blockade amplified therapeutic immunity to a tumor vaccine. Using a murine A20-HA tumor challenge model (35, 36), BALB/c mice were immunized with recombinant HA protein (1 μg) once weekly, with or without concurrent administration of LC. Tumor growth was significantly reduced in mice that received vaccination plus LC treatment (Fig. 4A). Spleen cells from vaccinated and LC-treated mice also produced significantly greater amounts of IFN-γ when restimulated ex vivo with MHC class I or II peptides from HA (Fig. 4B, 4C) or with live A20-HA cells (Fig. 4D). Weekly vaccination plus treatment with RS102895 also significantly reduced tumor growth rates compared with mice that were vaccinated only or treated only with RS102895 (Fig. 4E). Restimulation with MHC I or MHC II HA peptides or with live A20-HA cells resulted in significant increases in IFN-γ responses by spleen cells from animals vaccinated and concurrently treated with RS102895 (Fig. 4F–H). Numbers of inflammatory monocytes or myeloid-derived suppressor cells were significantly increased in tumor tissues of vaccinated mice compared with control mice, whereas this increase was significantly attenuated in animals that received RS102895 during vaccination (Fig. 4I, 4J, respectively). These results indicated, therefore, that inflammatory monocyte depletion or migration blockade could significantly amplify early therapeutic vaccine immunity in a tumor challenge model. Effects of vaccination and monocyte depletion or blockade on tumor growth and antitumor immunity. (A) Mice with s.c. implanted A20-HA tumors (n = 5 per group) were vaccinated weekly with a vaccine composed of 1 μg HA protein in CLDC adjuvant, administered s.c., as described in Materials and Methods. Treatment groups included untreated mice, mice that received vaccine alone, mice that were treated with LC only, or mice that were vaccinated and treated with LC. The vaccine was administered on days 3, 10, and 17 after tumor injection, and tumor growth was monitored every other day starting on day 10. Statistical significance was determined using two-way ANOVA with Bonferroni posttest. (B–D) On day 22 after tumor injection, mice were euthanized and spleen cells were collected and restimulated with the MHC class I (B) or II (C) restricted HA peptides, or with live A20HA cells at an E:T ratio of 75:1 (D) and monitored for IFN-γ release. (E) Mice with s.c. implanted A20-HA tumors were vaccinated weekly with a vaccine composed of 1 μg HA protein in CLDC adjuvant, administered s.c. Treatment groups included untreated mice, mice that received vaccine alone, mice that were treated with RS102895 alone administered i.p., or mice that were vaccinated and treated with RS102895. The vaccine was administered on days 3, 10, and 17 after tumor injection. Statistical significance was determined using two-way ANOVA with Bonferroni posttest. (F–H) On day 22, mice were euthanized and spleen cells were restimulated with the MHC class I (F) or II (G)–restricted HA peptides, or with live A20HA cells at an E:T ratio of 75:1 (H) and monitored for IFN-γ release. (I and J) Tumors were collected and analyzed by flow cytometry for evaluation of tumor-infiltrating populations of inflammatory monocytes (CD11b+Ly6chi) (I) or myeloid-derived suppressor cells (CD11b+GR1+) (J). Error bars represent SEM, n = 10. Statistical significance was determined using one-way ANOVA, followed by Tukey multiple means comparison test, *p < 0.05. These experiments were repeated in one additional independent experiment. Experiments were conducted to determine whether vaccine-elicited inflammatory monocytes had direct T cell–suppressive properties. Ly6G−CD11b+Gr-1+ myeloid cells were purified by flow cytometry from pooled LNs 24 h after footpad immunization, and the purified monocytes were then titrated into cultures of mitogen-activated naive spleen cells. T cell proliferation was significantly suppressed in a dose-dependent fashion after addition of purified inflammatory monocytes (Fig. 5A). Vaccine-elicited monocytes also significantly suppressed IFN-γ release from activated T cells (Fig. 5B). We also observed that mitogen-induced T cell proliferation was significantly increased in LN cells that were collected from mice that were vaccinated and concurrently received LC in vivo to deplete vaccine-elicited monocytes (Fig. 5C). Vaccine-elicited monocytes directly suppress T cell activation and proliferation. 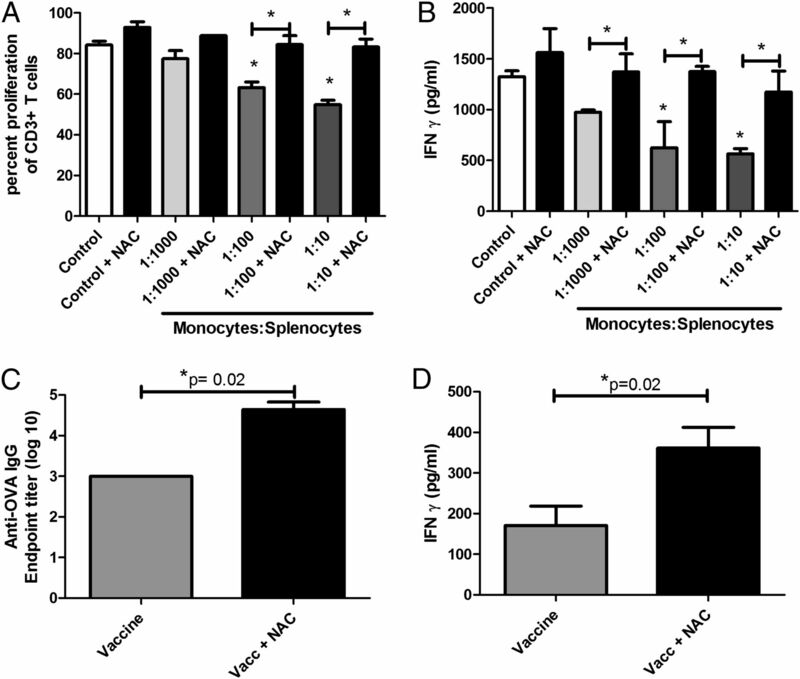 (A) Inflammatory monocytes were purified by flow sorting from vaccine draining LNs 24 h after vaccination and titrated at 3 ratios of monocytes/splenocytes (1:10, 1:100, 1:1000) into cultures containing CFSE-labeled spleen cells that were then activated in vitro with Con A (5 μg/ml). Proliferation of CD3+ T cells was assessed 4 d later by flow cytometry. (B) Supernatants from cultures in (A) were analyzed by ELISA for IFN-γ release. (C) Twenty-four hours after vaccination (with or without LC treatment), LN cells were harvested from the draining LNs and stimulated in vitro with Con A. CD3+ T cell proliferation was assessed 4 d later by flow cytometry. (D) T cells were stained with CFSE and stimulated to proliferate with Con A (5 μg/ml) for 96 h. Some cultures also were incubated with L-NMMA (300 μM), Nor-NOHA (200 μM), indomethacin (30 mM), Lox Block (20 μM), neutralizing Abs against TGF-β (1 μg/ml) or IL-10 (0.1 μg/ml), 2-ME (55 μM), or NAC (0.5 M). T cell proliferation was assessed by flow cytometry 4 d later. (E) Supernatants were collected after 96-h incubation and analyzed for IFN-γ release by ELISA. Error bars represent SEM, n = 5. Statistical significance was determined using one-way ANOVA, followed by Tukey multiple means comparison test, *p < 0.05. (F) Vaccine-elicited monocytes were analyzed for cell surface expression of the cystine importer, xCT, by flow cytometry. Filled histogram represents isotype control; open histogram represents xCT stained monocytes. Purified vaccine-elicited monocytes were cocultured with naive T cells, together with inhibitors of known myeloid suppression pathways (18, 37). When monocyte–T cell cocultures were treated with an inhibitor of the NO synthase pathway (L-NMMA) (38), with an arginase inhibitor (Nor-NOHA) (39), or with Lox block for blockade of lipoxygenase pathways 12 and 15 (28), there was no effect on monocyte-mediated suppression of T cell proliferation or IFN-γ release (Fig. 5D, 5E). Similarly, inhibition of PG release by treatment with indomethacin (40) also failed to reverse T cell suppression by monocytes (Fig. 5D, 5E). Neutralization of IL-10 and TGF-β with specific antisera had only modest effects on reversing monocyte-mediated T cell suppression (41, 42) (Fig. 5D, 5E). However, addition of an exogenous source of cysteine (NAC) or preventing the reduction of extracellular cystine to cysteine using 2-ME both significantly reversed monocyte-mediated suppression of T cell proliferation and cytokine release (Fig. 5D, 5E). In addition, we found that inflammatory monocytes in vaccine-draining LNs expressed high levels of the xCT amino acid transporter molecule, which has been reported to be critically involved in cystine uptake by myeloid cells (37) (Fig. 5F). These data suggested that extracellular cysteine, an important amino acid required for T cell activation, was involved in monocyte-mediated T cell suppression. We also observed that addition of NAC nearly completely rescued T cell proliferation and IFN-γ responses over a wide range of monocyte/T cell ratios (Fig. 6A, 6B). However, we cannot entirely exclude based on these experiments that the known antioxidant properties of NAC may play some role in the observed vaccine enhancement effects observed in this study. However, we do note that many of the other inhibitors used in the in vitro experiments such as indomethacin and lipoxygenase inhibitors also have antioxidant properties, yet did not alter T cell responsiveness. Vaccine-elicited monocyte-induced suppression of T cell activation and proliferation can be reversed by addition of exogenous cysteine. (A) Flow-purified monocytes were added to activated T cells (as in Fig. 5A), with or without the addition of 0.5 mM NAC as a cysteine source, and T cell proliferation was assessed using flow cytometry. (B) Supernatants from cultures in (A) were analyzed by ELISA for IFN-γ release. Statistical significance was determined using one-way ANOVA, followed by Tukey multiple means comparison test, *p < 0.05. Similar results were obtained in one additional independent experiment. (C) Mice were vaccinated against Ova with or without concurrent NAC treatment (100 mg/kg i.p., administered every 12 h for 4 treatments). This treatment was also administered for the boost immunization. Serum was collected 12 d after boost and monitored for anti-Ova IgG. (D) Splenocytes from mice in (C) were stimulated ex vivo with 50 μg/ml ova and monitored for IFN-γ release by ELISA. Error bars represent SEM, n = 5. Statistical significance was determined using a Mann–Whitney U test, *p < 0.05. The effects of NAC supplementation on vaccine responses were also assessed in vivo. Immunized mice were concurrently treated with NAC administered i.p. at 100 mg/kg, and vaccine responses were compared with those of mice that were only vaccinated. Mice treated with NAC at the time of vaccination had significantly increased Ab titers compared with mice that were only vaccinated (Fig. 6C). In addition, NAC-treated and vaccinated mice generated significantly greater quantities of IFN-γ from spleen cells after Ag stimulation ex vivo (Fig. 6D). These data are therefore consistent with the hypothesis that cysteine sequestration by vaccine-elicited inflammatory monocytes was the primary mechanism of T cell suppression and vaccine counterregulation (see Fig. 7 for schematic). The results of the studies presented in this article provide strong evidence for a previously undescribed immunosuppressive and paradoxical counterregulatory role for inflammatory monocytes in vaccine immunity. 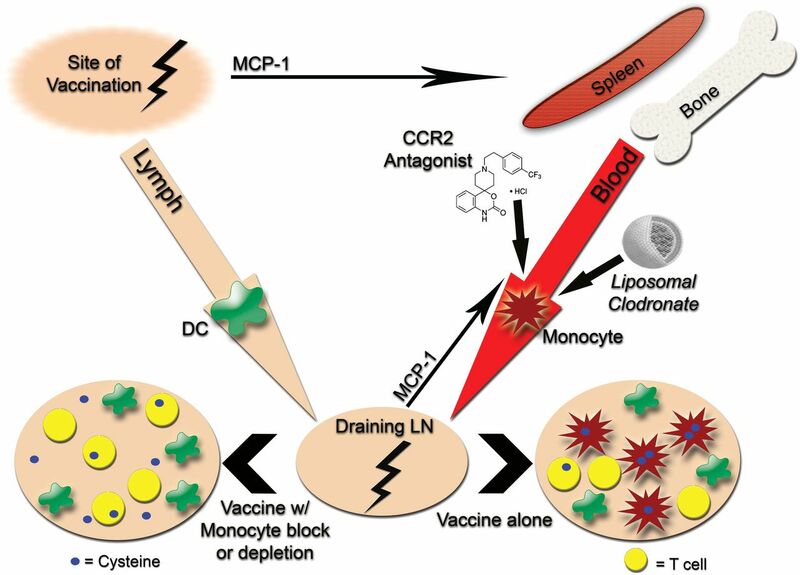 Our studies showed that inflammatory monocytes could be rapidly recruited to vaccine draining LNs in an MCP-1–dependent fashion and once there, monocytes potently suppressed local T cell responses in LNs by sequestering cysteine. 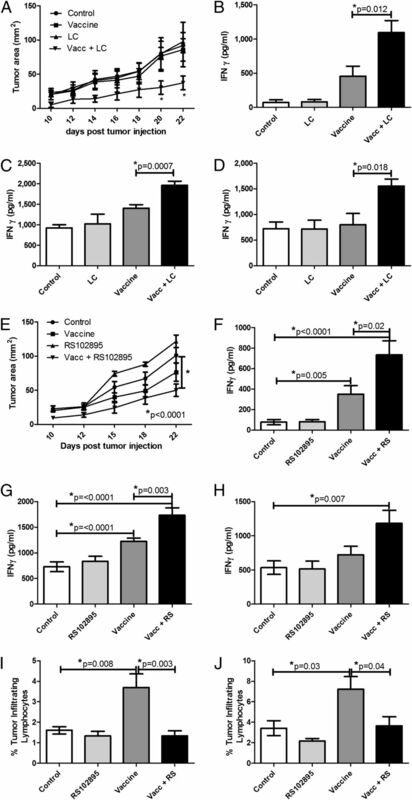 These conclusions were based on evidence that: 1) immune responses to vaccination were significantly enhanced in CCR2−/− mice; 2) immune responses to vaccination were significantly enhanced when inflammatory monocytes were depleted or their migration blocked; 3) purified vaccine-elicited monocytes directly suppressed T cell responses in vitro; and 4) addition of exogenous cysteine nearly completely reversed the T cell–suppressive effects of inflammatory monocytes, both in vitro and in vivo. Therefore, we propose a model wherein inflammation associated with vaccination triggers local production of MCP-1 and induces rapid immune counterregulatory responses that are mediated by inflammatory monocytes recruited to vaccine draining LNs (Fig. 7). Proposed model of inflammatory monocyte-mediated counterregulatory immune responses to vaccination and the role of monocyte depletion or blockade in amplifying vaccine immunity. Inflammatory monocytes are likely to be generated anytime local inflammation develops, resulting in MCP-1 production. Indeed, we saw that depletion of monocytes during vaccination with a variety of adjuvants enhanced vaccine immunity. In fact, it was previously reported that exposure to even very low doses of TLR agonists was sufficient to mobilize inflammatory monocytes from the bone marrow (43). It is likely, therefore, that inflammatory monocytes move into circulation shortly after local release of MCP-1 and migrate to sites of inflammation to serve an important homeostatic function. Although this response may be helpful during inflammatory disease states, we show that the counterregulatory response elicited by these monocytes can limit immune responses during vaccination. Therefore, transient blockade of monocytes during the vaccination process is an attractive therapeutic target that warrants further study. Vaccine-elicited inflammatory monocytes appear to use a relatively unusual mechanism to suppress T cell responses. Whereas tumor-generated monocytic myeloid suppressor cells have typically been reported to suppress T cell function by production of arginase or NO, vaccine-elicited inflammatory monocytes suppressed T cell responses by depleting extracellular cysteine, most likely by sequestering its precursor molecule cystine. This mechanism of T cell suppression was reported recently for tumor-elicited myeloid suppressor cells (37). Because T cells require extracellular cysteine for activation and proliferation, the loss of available cysteine after monocyte sequestration of cystine results in significant suppression of T cell function (see Fig. 6). This mechanism differs from that reported by Martino et al. (9), which identified NO as the causative component of BCG-elicited, myeloid cell–mediated immunosuppression. Interestingly, Martino and colleagues (9) did not report finding these cells in the draining LNs earlier than 3 d after vaccination, whereas we identify vaccine-elicited monocytes in the node within 24 h of vaccination, suggesting that early responding monocytes that suppress through a cysteine-dependent mechanism may actually be a different population than that reported by Martino and colleagues (9). In addition, our results differ from those of Nakano et al. (10), who concluded that inflammatory monocytes elicited by vaccination actually enhanced immune responses. The immunization models used in our studies and those used by Nakano et al. (10) were not identical, but we believe the discrepancy can be best explained by the fact that Nakano et al. (10) did not directly evaluate T cell or B cell responses to vaccination, nor did they examine how monocyte blockade or depletion affected those responses. Nakano et al.’s (10) publication also noted that because the CCR2−/− mice lacked a sufficient IFN-γ response, then monocytes must be important in augmenting vaccine immunity. However, the known IFN-γ production defect in CCR2−/− mice would have made it difficult to directly compare IFN-γ production after vaccination of wild type versus CCR2−/− mice (11). We believe the monocyte-mediated vaccine counterregulatory immune responses described in this article are broadly relevant, because they were found to occur after immunization with a variety of adjuvants and Ags. Recently, Fridlender et al. (44) reported that a population of CD11c+ cells was recruited via a CCL2-dependent mechanism after vaccination and augmented cancer immunotherapy. Although the vaccine-elicited monocytes described in our study did not express CD11c+, it remains possible that they may alter their phenotype over time and, therefore, may represent a less differentiated population of cells than those reported by Fridlender et al. (44). In addition, the phenotype of vaccine-elicited inflammatory monocytes may differ significantly in normal animals as in our studies versus their phenotype in animals that already have cancer, as in the Fridlender studies. Finally, the monocyte migration response reported in this study was most likely TLR independent because it was also observed after immunization with alum adjuvant, although the TLR independence of the effect was not formally examined in our study. Many inflammatory stimuli can induce MCP-1 production; therefore, signaling via CCR2 may be the common thread linking vaccine adjuvants and counterregulatory immune responses mediated by inflammatory monocytes (45–49). Our data indicated that MCP-1 was the major chemokine required to mobilize and recruit inflammatory monocytes after vaccination. The key role played by the MCP-1/CCR2 signaling pathway in regulating vaccine suppression by monocytes may make it possible to use specific chemokine receptor antagonists as a new type of “vaccine adjuvant-adjuvant.” For example, administration of a CCR2 antagonist at the time of vaccination significantly enhanced vaccine humoral and cellular immune responses (see Fig. 3). Thus, it should be possible to substantially improve vaccine effectiveness using chemokine receptor antagonists already under development for treatment of inflammatory disorders in humans (50, 51). Finally, vaccine amplification by administration of chemokine receptor antagonists and/or concurrent administration of cysteine may be particularly attractive as strategies to boost vaccine responses in difficult to vaccinate populations such as the very young and the elderly. We thank Dr. Scott Hafeman for preparing the LC used for these studies and Leslie Armstrong for assistance with flow sorting. We also thank Dr. Charles Drake at The Johns Hopkins University for kindly providing the A20-HA cell line. This work was supported by a grant from the Skippy Frank Translational Medicine and Life Sciences Fund, a Colorado State University Infectious Diseases Research Center grant, and National Institutes of Health Grant U54 AI065357-05.
. 2010. Vaccine adjuvants: putting innate immunity to work. Immunity 33: 492–503.
. 2009. New horizons in adjuvants for vaccine development. Trends Immunol. 30: 23–32.
. 2009. 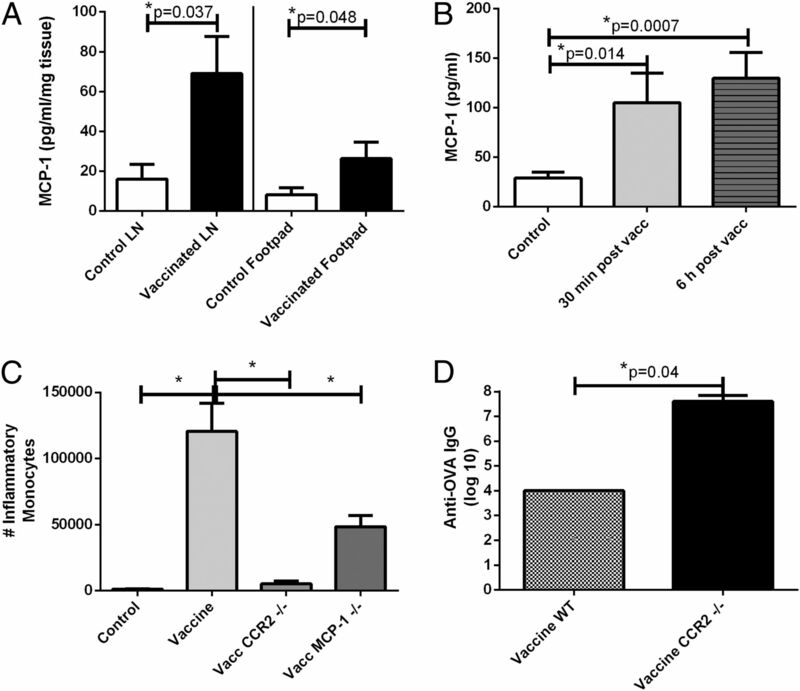 Uptake of particulate vaccine adjuvants by dendritic cells activates the NALP3 inflammasome. Proc. Natl. Acad. Sci. USA 106: 870–875.
. 2008. Molecular and cellular signatures of human vaccine adjuvants. Proc. Natl. Acad. Sci. USA 105: 10501–10506.
. 2009. Mechanism of action of licensed vaccine adjuvants. Vaccine 27: 3331–3334.
. 2005. Dendritic-cell trafficking to lymph nodes through lymphatic vessels. Nat. Rev. Immunol. 5: 617–628.
. 2008. Inhibition of dendritic cell differentiation and accumulation of myeloid-derived suppressor cells in cancer is regulated by S100A9 protein. J. Exp. Med. 205: 2235–2249.
. 2004. High-dose granulocyte-macrophage colony-stimulating factor-producing vaccines impair the immune response through the recruitment of myeloid suppressor cells. Cancer Res. 64: 6337–6343.
. 2010. Mycobacterium bovis bacillus Calmette-Guérin vaccination mobilizes innate myeloid-derived suppressor cells restraining in vivo T cell priming via IL-1R-dependent nitric oxide production. J. Immunol. 184: 2038–2047.
. 2009. Blood-derived inflammatory dendritic cells in lymph nodes stimulate acute T helper type 1 immune responses. Nat. Immunol. 10: 394–402.
. 2000. A mechanism for the impaired IFN-gamma production in C-C chemokine receptor 2 (CCR2) knockout mice: role of CCR2 in linking the innate and adaptive immune responses. J. Immunol. 165: 7072–7077.
. 2008. Gr1(+) inflammatory monocytes are required for mucosal resistance to the pathogen Toxoplasma gondii. Immunity 29: 306–317.
. 2010. Critical protective role for MCP-1 in pneumonic Burkholderia mallei infection. J. Immunol. 184: 1445–1454.
. 2008. An integrated model of the recognition of Candida albicans by the innate immune system. Nat. Rev. Microbiol. 6: 67–78.
. 1983. Killing of Listeria monocytogenes by human neutrophils and monocytes, but not by monocyte-derived macrophages. J. Reticuloendothel. Soc. 34: 29–44.
. 2006. Phosphodiesterase-5 inhibition augments endogenous antitumor immunity by reducing myeloid-derived suppressor cell function. J. Exp. Med. 203: 2691–2702.
. 2009. Sunitinib mediates reversal of myeloid-derived suppressor cell accumulation in renal cell carcinoma patients. Clin. Cancer Res. 15: 2148–2157.
. 2009. Combination of all-trans retinoic acid and a human papillomavirus therapeutic vaccine suppresses the number and function of immature myeloid cells and enhances antitumor immunity. Cancer Sci. 100: 334–340.
. 2010. The inflammasome component NLRP3 impairs antitumor vaccine by enhancing the accumulation of tumor-associated myeloid-derived suppressor cells. Cancer Res. 70: 10161–10169.
. 2010. Evaluation of liposomal clodronate for treatment of malignant histiocytosis in dogs. Cancer Immunol. Immunother. 59: 441–452.
. 2003. “In vivo” depletion of macrophages by liposome-mediated “suicide”. Methods Enzymol. 373: 3–16.
. 2012. Involvement of CCR-2 chemokine receptor activation in ischemic preconditioning and postconditioning of brain in mice. Cytokine 60: 83–89.
. 2012. Ammonium pyrrolidine dithiocarbamate and RS 102895 attenuate opioid withdrawal in vivo and in vitro. Psychopharmacology (Berl.) 220: 427–438.
. 1999. Lipid-DNA complexes induce potent activation of innate immune responses and antitumor activity when administered intravenously. J. Immunol. 163: 1552–1561.
. 2008. Novel lipoxygenase inhibitors as neuroprotective reagents. J. Neurosci. Res. 86: 904–909.
. 2012. Serum inhibits the immunosuppressive function of myeloid-derived suppressor cells isolated from 4T1 tumor-bearing mice. Cancer Immunol. Immunother. 61: 643–654.
. 2006. Efficient immunization and cross-priming by vaccine adjuvants containing TLR3 or TLR9 agonists complexed to cationic liposomes. J. Immunol. 176: 7335–7345.
. 2011. CCL2 recruits inflammatory monocytes to facilitate breast-tumour metastasis. Nature 475: 222–225.
. 2012. CCR2 acts as scavenger for CCL2 during monocyte chemotaxis. PLoS ONE 7: e37208.
. 2010. Spiral ligament fibrocyte-derived MCP-1/CCL2 contributes to inner ear inflammation secondary to nontypeable H. influenzae-induced otitis media. BMC Infect. Dis. 10: 314.
. 2000. Identification of the binding site for a novel class of CCR2b chemokine receptor antagonists: binding to a common chemokine receptor motif within the helical bundle. J. Biol. Chem. 275: 25562–25571.
. 2008. Myeloid-derived suppressor cells promote cross-tolerance in B-cell lymphoma by expanding regulatory T cells. Cancer Res. 68: 5439–5449.
. 2010. Chemotherapy rescues tumor-driven aberrant CD4+ T-cell differentiation and restores an activated polyfunctional helper phenotype. Blood 115: 2397–2406.
. 2010. Bone marrow myeloid-derived suppressor cells (MDSCs) inhibit graft-versus-host disease (GVHD) via an arginase-1-dependent mechanism that is up-regulated by interleukin-13. Blood 116: 5738–5747.
. 2010. COX-2 inhibition improves immunotherapy and is associated with decreased numbers of myeloid-derived suppressor cells in mesothelioma. Celecoxib influences MDSC function. BMC Cancer 10: 464.
. 2010. Transforming growth factor beta (TGF-beta) and inflammation in cancer. Cytokine Growth Factor Rev. 21: 49–59.
. 2011. Bone marrow mesenchymal stem and progenitor cells induce monocyte emigration in response to circulating toll-like receptor ligands. Immunity 34: 590–601.
. 2010. CCL2 blockade augments cancer immunotherapy. Cancer Res. 70: 109–118.
. 2002. Roles of toll-like receptors in C-C chemokine production by renal tubular epithelial cells. J. Immunol. 169: 2026–2033.
. 2008. The inflammasome recognizes cytosolic microbial and host DNA and triggers an innate immune response. Nature 452: 103–107.
. 2010. Molecular mechanisms involving sigma receptor-mediated induction of MCP-1: implication for increased monocyte transmigration. Blood 115: 4951–4962.
. 2009. A novel vaccine adjuvant comprised of a synthetic innate defence regulator peptide and CpG oligonucleotide links innate and adaptive immunity. Vaccine 27: 4662–4671.
. 2010. IL-17-mediated monocyte migration occurs partially through CC chemokine ligand 2/monocyte chemoattractant protein-1 induction. J. Immunol. 184: 4479–4487.
. 2009. Chemokine receptor antagonists: overcoming developmental hurdles. Nat. Rev. Drug Discov. 8: 23–33.
. 2009. Recent developments in CCR2 antagonists. Expert Opin. Ther. Pat. 19: 295–303.